leading to the most beautiful unexplored beaches. offer the ideal environment for our retreat. musical workshops with percussion instruments from around the world. Every one will find their place in the circle and choose the percussion instrument most suitable for their mood (djembe, doundoun, caxixi, bells). Through various rhythmical games we will explore the multiple sound possibilities of drumming and feel the group dynamics, under the guidance of our experienced facilitator. Sound and emotions are deeply connected. Human emotions have their immediate expression through sound, and it is often the repression of the sound of the emotions that creates emotional blockages. while creating our own music together as a group! Anafi is a small island situated on the south eastern side of Cyclades, close to Santorini. Due to its small size and few inhabitants, Anafi remains a pure island, untouched by mass tourism. 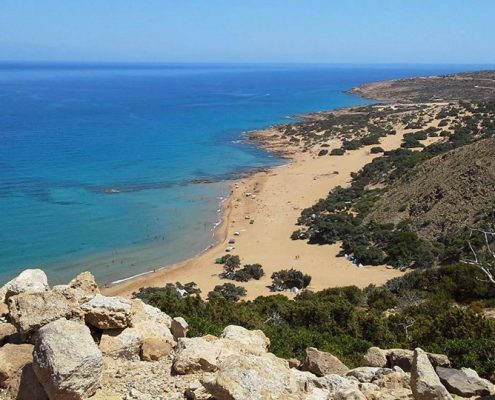 It has only one village and numerous crystal beaches around its coastline. Chora, the capital village, is constructed on the mountain slopes and offers a breathtaking view of the Aegean Sea, as well as unforgettable sunsets and sunrises. The village is built on the ruins of a venetian castle, with the distinct Cycladic architecture of small white houses and blue window frames, decorated by colorful flowers. 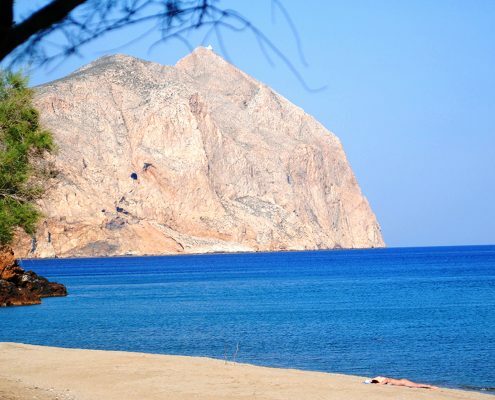 Isolated in its simplicity, Anafi is the ideal location for this alternative retreat. The best way to get to know Anafi, is through the amazing trekking trails. Many tours will be organised during our stay in order to explore this very special island. Starting from Hora, the main village, we will wonder off and discover breathtaking sights and virgin beaches of unspeakable beauty. The highlight will be the exciting hike to the gigantic rock of Kalamos, the second largest solid rock in the Mediterranean after Gibraltar. This rocky formation, in the eastern edge of the island, is particularly renowned to the experienced climbers and mountaineers. The trek has an approximate duration of 90 minutes in an ascent of 461 meters. An old monastery lies at the top with a 360-degree view of the sea and the surrounding islands in the horizon. The excursion will begin at early dawn in order to reach the top in time for a silent meditation during sunrise, an undoubtedly unforgettable experience. Chora the main village of the island will be the base for most of our activities. There are many available accommodation options with prices ranging from 40-70€ per night. Please contact us for suggestions and assistance when making your reservation. The schedule includes many activities, but also a lot of free time for everyone to enjoy their holidays depending on their needs and preferences. 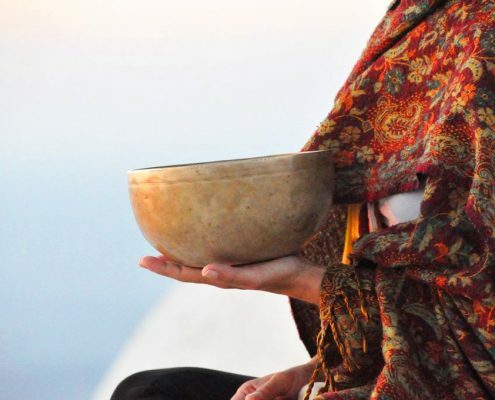 You will have the option to join sunrise meditations, morning and evening yoga classes, trekking excursions, and other creative activities, but you can also relax, enjoy the beach and the wonderful views all around. Although our team has designed a full schedule for the week, we encourage you to join the activities that you feel will benefit you the most. Our goal is for everyone to feel free, rest, and enjoy their holidays without the slightest pressure of having to do something. You can reach Anafi only by boat from the following locations which have international airports. 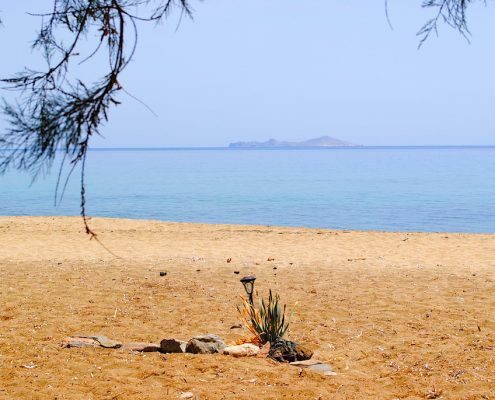 and you can also find connections with other Cycladic islands depending on the dates you will be travelling. Please contact us for assistance before making reservations! Please get in touch with us so we can help you plan your trip. We will then send you a confirmation email with all necessary information as well as a short medical questionnaire to fill out and send back. You will be requested to make a deposit of 100€ to secure your place. yoga mat, relaxation blanket, towel, comfortable clothes, hat, walking shoes, antimosquito and sunblock. (tent, sleeping bag, torch etc.). Nikos co-founded the non-profit organization Pangea World Music Center, which aims to cultivate and disseminate various forms of art from around the world in the wider Greek public. 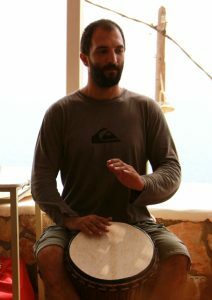 After completing a course in modern and traditional percussion in Greece, he participated in many workshops in West Africa, deepening in African percussion and performing alongside famous musicians, including Ponda oBraian, Drissa Conne, Reiner Polak, Harouna Dembele. He is actively engaged in the dissemination of African music culture and teaching and organizing percussion workshops, musical events, and concerts. 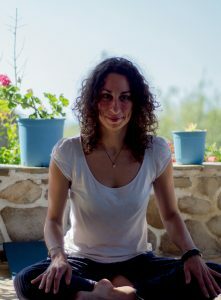 Marilou has been practicing since 2002 and has been sharing her understanding of the teachings since 2010 when she received her first Yoga Teacher Training Diploma (RYT 200hr) from Sivananda Vedanta Centre. Following the desire to deepen her knowledge, in 2012 she completed the Advanced Teacher Training Course (RYT 500hr) in Ghyta Yoga School. She was naturally drawn to the Iyengar way, taking classes and participating in workshops with many inspiring instructors. Her classes focus also on detail, precision and the structural alignment of the body, always with respect to individual boundaries and limitations.